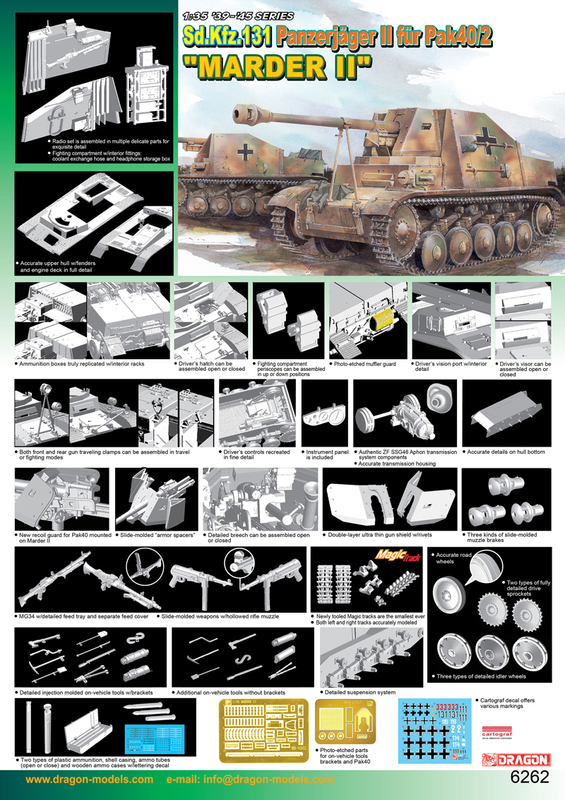 1/35 Sd.Kfz.131 Panzerjager II fur Pak40/2 "Marder II"
1/35 7.5cm Pak 40/2 auf Fgst Pz.Kpfw.II (Sf) "Marder II"
This model features an open-top fighting compartment which allows us to pack it full with detail. With the exception of the PaK 40, everything in this kit is brand new. It also includes Dragon's smallest ever Magic Tracks! By early war standards, the Panzer II was totally outclassed, and so a decision was made to use the Panzer II Ausf. F chassis as a basis for a self-propelled tank destroyer. The resulting Marder II (Sd Kfz 131) mounted the effective 75mm PaK40/2 gun in a high superstructure. The Marder II appeared in Panzerjager detachments from 1942 onwards, and they were to serve on till the end of WWII.